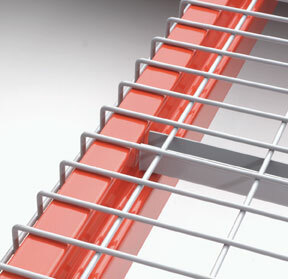 Craig Chamberlain has an article over at the MHEDA Edge website that you need to read if you use pallet rack wire decking. Standards for rating rack decking capacity have just recently been standardized by the Rack Manufacturers Institute (RMI). According to Chamberlain, before the end of the year, ANSI MH26.2 will be the basis by which RMI will certify with an R-Mark a given load table for decking when that deck manufacturer can prove their strict conformance to MH26.2. We’ll have apples-to-apples, at least among RMI-member manufacturers. Your beams and uprights must be able to bear more weight than the decking. This means that sure, there are decks with more than 3,000 pound capacity, but if you have 5,000 pound capacity beams in a 2-pallet per bay configuration, you can only put 2,500 pound loads on each pallet. “Short” loads or pallets that sit entirely on the decking, and don’t overlap so that they set on beams will reduce capacities of the entire rack due to the way weight is distributed. This is why rack uprights are rated for evenly distributed loads. More details on this here. 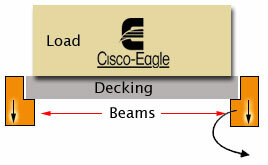 Decks made with a different number of channels and lighter gauges of steel do not have the same rated capacity. You really do get what you pay for when it comes to rack decking. What if you don’t know? If you’re not sure exactly how to calculate capacities between your rack and decking, contact a professional to assist you.